This article covers the work of Dr Burzynski. The work has sparked a great deal of controversy. There are those that think he really has made an important breakthrough in a non-toxic therapy and that the FDA and pharmaceutical companies are just trying to silence him. While others argue that, even 30 years on, there is no definitive single Clinical Trial on his work. By analysing the urine of cancer patients compared to healthy people, he discovered there were missing peptides in the cancer patients. His solution? ’Antineoplastons’. Years of wrangling and court cases in Texas seem now to be ended. During that time pharmaceutical companies tried to patent the antineoplastons and failed. ’Why - if they don’t work?’ argue the fans. Now, in his 2011 video, Burzynski says that his work is approved at Clinical Trial II level and that all patients are part of a Clinical Phase III trial. Sceptics say that putting patients into a trial is the only legal way he is allowed to treat anybody. It’s not my job to judge - just to pass on the information. You must make your own decisions. His work is being monitored by the FDA, he treats many different cancers, with a bias to brain tumours, and he claims to have developed the only non-toxic treatment that has actually been proven to cure a cancer. He.has a factory procing the peptides and over a hundred people working for him. No surprise then that his private clinic and treatments do not come cheap. At CANCERactive we try to provide balanced information, what you do with it is your business. For almost 30 years one man has pioneered an alternative therapy, originally for brain tumours but which now seems as widely applicable to any cancer. After threats, lawsuits and raids on his premises is he finally being accepted into the mainstream, with the FDA closely monitoring his work in clinical trials and approval expected shortly? Chris Woollams reports. In case you don’t know, peptides are short chains of amino acids, whilst proteins are long chains of more than 50. Burzynski showed that antineoplastons both turn off the ras gene and restimulate the p53 suppressor. He thinks of antineoplastons as ’switches’ turning some things off and others back on. Antineoplastons provide the messages which tell the genes to act. Without enough of these crucial peptides the risk of cancer is higher. And then it all went pear-shaped. Burzynski’s discoveries were at first applauded and he was offered a higher post but in Baylor’s Department of Pharmacologya job he turned down. Almost immediately his research grant was not extended and he was left outside of ’the system’. Since there was no statute in Texas preventing him from ’treating’ patients with this essentially non-toxic solution, he set up shop for himself. However the US District Court then banned him from shipping his product across state borders. Since he couldn’t stop patients from taking the product back to their homes in other states, he was subjected to Grand Jury investigation, and eventually tried on over 70 charges. One by one he beat all of these and, 14 years later, the FDA and the District Court gave in. An important part of the defence was that these antineoplastons work! In 1991 a group of investigators from the National Cancer Institute went to the Burzynski Research Institute in Houston and reviewed his ’best 7 cases’, where patients - mainly with astrocytomas and glioblastomas - had experienced complete responses to the ’drugs’. The NCI recommended a Phase II clinical trial, which began in 1993 and was overseen by such eminent institutions as the Mayo Clinic and Sloan-Kettering Cancer Center. However, only nine patients were assessed, and the final report concluded that the results were insufficient to recommend antineoplastons for wider use. In his report Burzynski noted the general consensus in the medical community is that these brain tumours cannot be cured by chemotherapy, and the response rate is only modest. However he, himself, achieved a complete tumour resolution, or over 50 percent tumour reduction, in 16 of his 36 patients. Burzynski continued his efforts. In 2006 he claimed he had over 2000 patients in full clinical trials all supervised by a more agreeable FDA. He also gained FDA approval for a supplement for home use, but he stresses that this is not, by any means, a replacement for formal therapy. Burzynski was back then highly confident that the FDA would fully approve one of his oral formulations containing antineoplastons by the end of 2007, with approval for an intravenous formulation by the end of 2008. Somehow it didn’t happen. So, are we any clearer? Currently researchers in Kurume University in Japan are also exploring the effects of antineoplastons, not only with all types of brain tumours, but also with colon and liver cancers. Numerous genes have been identified and linked to a number of cancers; others are specific to a certain type of cancer. 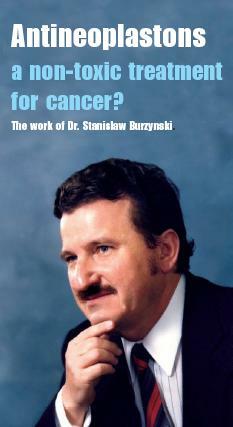 Burzynski and the Japanese are studying which genes are blocked, and which are over active with which cancers. It is early days but the full picture may be less than ten years away and it could have wonderful results. The highly prestigious MD Anderson Cancer Center in Houston, confirm Burzynski’s initial antineoplaston theories. But a single, good quality clinical trial wouldn’t hurt, would it? Recently, Burzynski has developed new formulations, and believes that far more active packages will be developed in the future. Indeed he believes antineoplastons will eventually become a mainstream treatment for all cancers. At the end of the day, even including alternative and possible complementary treatments such as Professor Pilkington’s work on Chlomipramine, there is currently no totally effective brain tumour chemotherapy drug as a ’cure’, largely because the blood-brain barrier is primarily there to prevent just such a chemical from entering the brain. Nor is there adequate research on non-toxic, natural therapies, but clearly these will have far better potential to address problems within the brain. It is increasingly felt likely by some experts that the only successful treatment for brain tumours will be ’natural! With regard to other cancers, the potential is enormous if you agree that generally cancer patients are deficient in certain peptides. The only problem would be that if peptide production cannot be restimulated (and this probably means finding a cause for the lowered production in the first place) the peptide mixes have to be taken by the patient for an extended period of time with significant implications in terms of costs and side-effects. (Although probably far less than, say, Herceptin and some of the other new drugs coming in). So is Burzynski just another brick in a wall of failure or is he on his way to a Nobel Prize with his pioneering, non-toxic treatment? The factory is now huge, with large numbers of employees - this is no longer a man and an idea. We are encouraged that the FDA is now monitoring and reporting on his work - proper data would show once and for all whether this was a real cancer cure, or quackery.